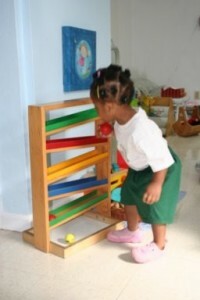 Our Montessori Toddler environment is designed for children 18 months to three years of age. 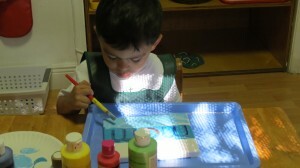 It is a place for toddlers to discover their independence in a safe and purposefully planned classroom while working with age appropriate lessons and enjoying second language instruction as part of their curriculum.The Toddler school day begins with individual instruction and independent work for a period of about 2 hours. 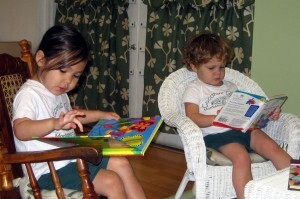 The toddlers frequently work in small groups, or with a teacher who presents lessons according to child-readiness. Midmorning, the children gather as a group for snack time where they assist in the preparation of the snack and table setting. They serve themselves and clean up after themselves. Grace, courtesy, and table manners are modeled and encouraged by the teachers. Parents take turns providing a healthy snack each day for the entire class. A water dispenser with fresh spring water and cups are available to the children throughout the school day. In addition, toddlers spend 30 minutes outside in the playground, and time is allowed for toilet training. Since music and circle time are an important part of the curriculum, to round out the morning, the children engage in musical activities, using prerecorded children’s music and various musical instruments. Circle time activities also include phonemic activities, movement and dance, stories and songs in preparation for language arts readiness. 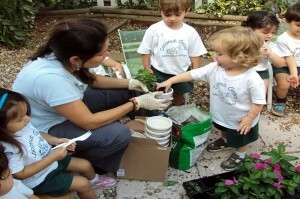 The CGMS Toddler program is flexible and comprehensive. It is comprised of three classrooms each providing flexible scheduling options: half day program (8:30-11:30), full day program (8:30-2:30). In addition, we offer the option of attending 3 times a week, 4 times a week or 5 times a week. Once you have decided what your schedule needs are, you will also have the choice of 2 different language programs to meet your family’s specific desires. We offer Bilingual English/Spanish speaking classrooms and Spanish Immersion classrooms. The English/Spanish bilingual program delivers all instruction and activities using the “One Parent – One Language” approach wherein one teacher speaks exclusively English while the other teacher speaks exclusively Spanish. The Spanish immersion program concentrates on developing oral language fluency in Spanish within the Montessori curriculum. Click here to view and download our Curriculum Guide. Following receipt of Admission Application Form, the school will contact you to schedule Enrollment Meeting. August to June Annual Tuition $9,500 half day (8:30-11:30); $11,000 full day (8:30-2:30). Partial week schedules available. After School Care until 6:00p.m. available for our students at an annual cost of $3,000. Tuition may be paid annually, semi-annually, or monthly.